Plymouth, Massachusetts-based Aeronautica Windpower LLC has signed an exclusive licensing agreement with Denmark’s Norwin A/S to manufacture commercial scale wind turbines in the USA for the North American and Caribbean markets, Aeronautica announced yesterday. Aeronautica is looking to raise additional capital and negotiating a site in New England for its new factory, which would be the first of its kind in the USA. Management anticipates shipping the first of its Norwin 225 and 750-kilowatt turbines later this year. The new plant would be an addition to Aeronautica’s existing refurbishing facilities in Plymouth, and would create 80 to 100 new jobs. Hundreds of additional jobs would be created from the manufacture of subcomponents and assemblies, which the company plans to source from across the country, management said. Aeronautica intends to manufacture “sub-megawatt” class wind turbines capable of generating anywhere from 100 to 1,000 kilowatts of electricity at the new factory. The so-called “queen-sized” wind turbines are better suited to more densely populated areas than those that are typically installed in mid-western and western states, where open space is more abundant. The queen-sized turbines are said to be ideal for use at shopping centers, industrial parks, community wind projects, schools and municipal facilities. The company will erect a 750-kilowatt wind turbine to power its new plant. Aeronautica is offering turbines at discounts to schools and colleges under a program devised specifically for facilities with good wind resources. More than 1.6million gallons of foreign oil– the equivalent of a line of oil tank trucks more than three miles long–is avoided for each 750-kW wind turbine installed, according to the company. 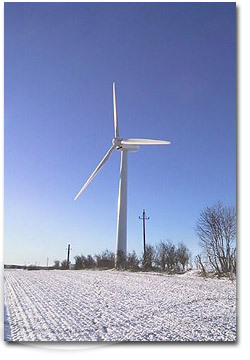 Danish wind turbine manufacturers have the leading position in the large wind turbine fields. Aeolos wind turbines were installed more than 700 small wind turbines in 2008 in USA.